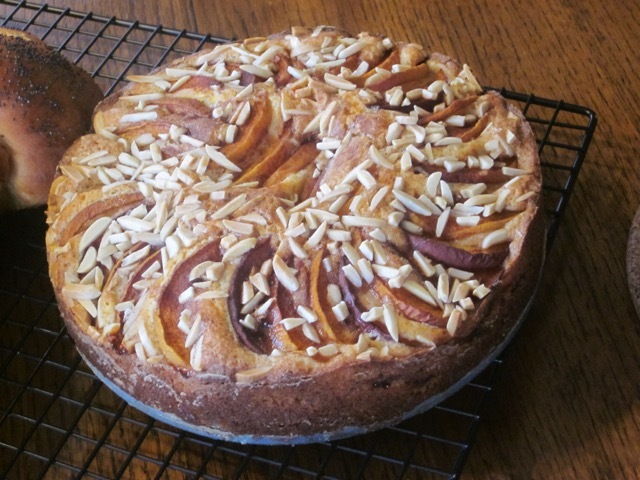 Two weeks ago, we had this peach and almond cake, warm, with some ice-cream on the side. It was a simple but fulfilling dessert. You can use nectarine instead of peach or plums??? or perhaps, ripe pears. I am not a fan of plum because the ones sold in my local store are so bland and tasteless. Happy Baking! Add the sifted flour, lemon zest and butter to a food processor bowl and process until it resembles fine breadcrumbs. Add the eggs and milk, and process using pulse action until just combined. 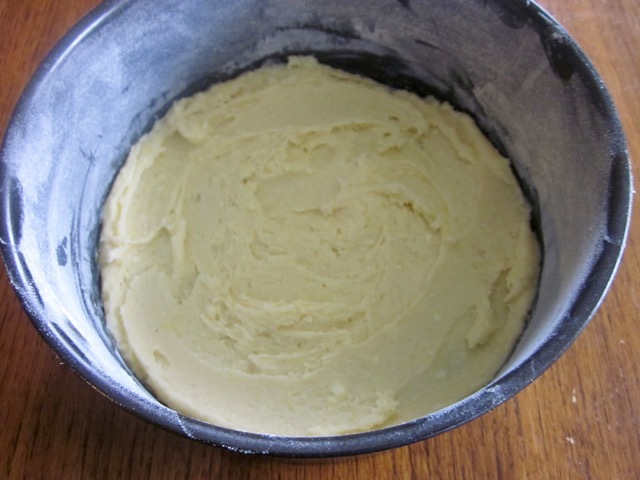 Spread half the batter evenly into the prepared tin (pan). 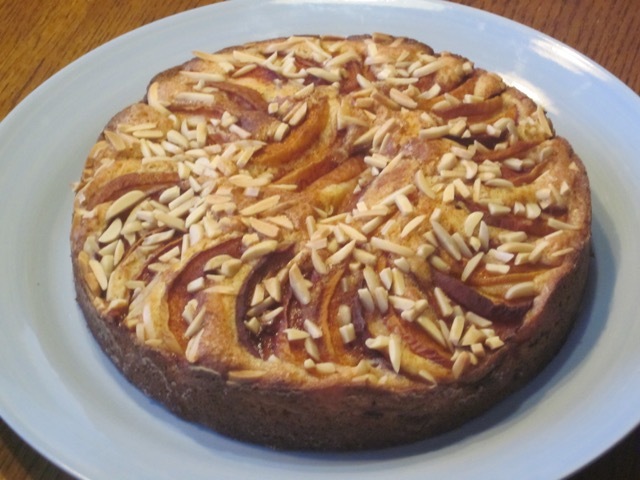 Sprinkle with half the almonds and top with half the peach slices and half the cinnamon sugar. 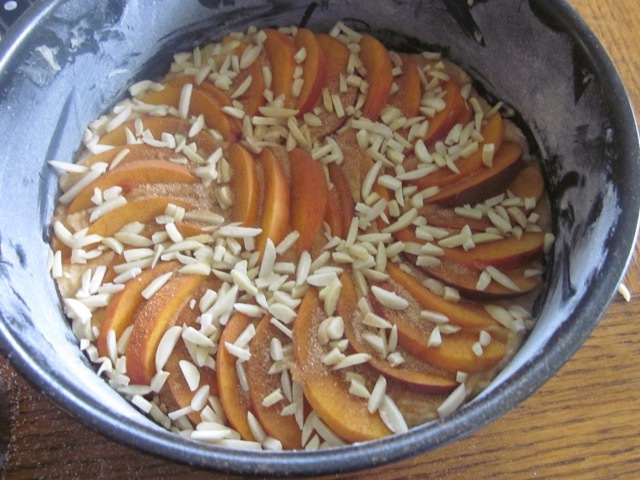 Spread the remaining mixture evenly over the first layer of peach and then arrange the remaining peach slices on top. Sprinkle with remaining almonds and cinnamon sugar. Bake 50 minutes or until golden and a skewer inserted in the centre comes out clean. Leave the cake in the pan for 10 minutes then transfer to a cooling rack. Sift the flour, baking powder and sugar into a bowl. Preheat the oven to 350ºF (180ºC) ten minutes before using. Grease and line the base of an 8-inch (20cm) spring form pan. Flour the sides. 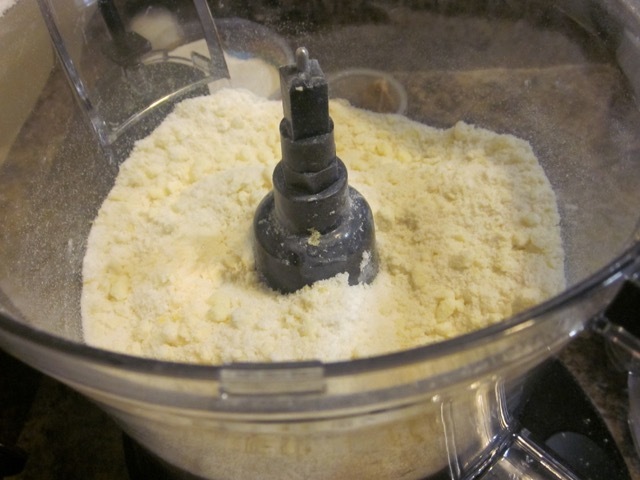 Add the sifted flour, lemon zest and butter to a food processor bowl and process until it resembles fine breadcrumbs. Add the eggs and milk and process using pulse action until just combined. Spread half the mixture evenly into the prepared tin (pan). 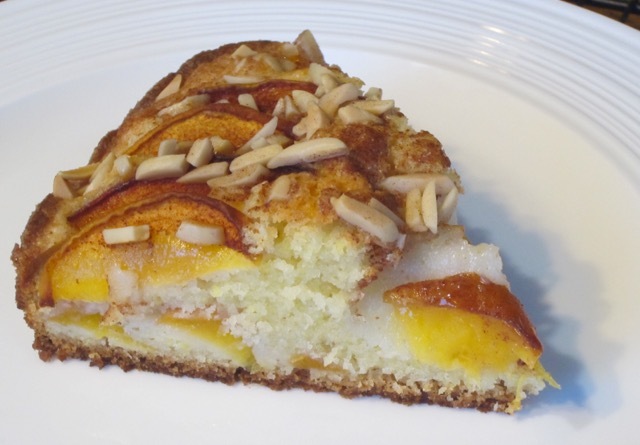 Sprinkle with half the almonds and top with half the peach slices and half the cinnamon sugar. 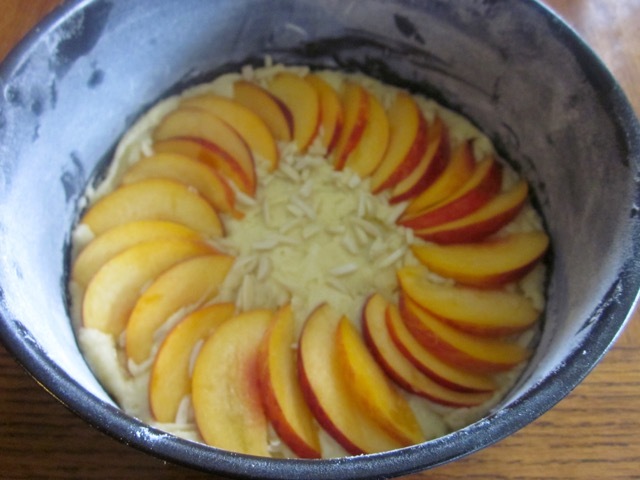 Spread the remaining batter evenly over the first layer of peach and arrange the remaining peach slices on top. Sprinkle with remaining almonds and cinnamon sugar. Bake 50 minutes or until golden and a skewer inserted in the centre comes out clean. Leave in the pan 10 minutes then transfer to a cooling rack. I baked at 350ºF (180ºC) for 50 minutes. For cup measures: (use 240ml cup) spoon the flour into the cup, heaping it up over the top, then slide a knife across the top to level off the extra. Be careful not to shake or tap the cup to settle down the flour or you will have more than you need. Next What is Laird Lentil? A cup of afternoon tea. Great! 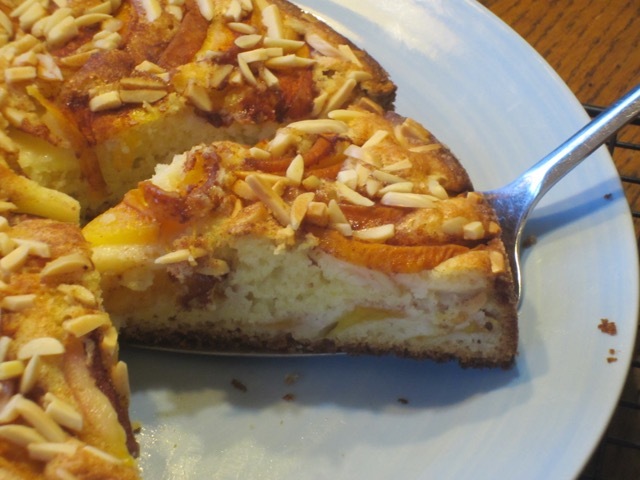 Peaches & almonds – a delicious combination, the cake must’ve been really tasty! It was very nice. I really love nuts! I might have to stop reading your blog. All these cake and bread photos…I’m gaining pounds just looking at your pictures! And the holidays are right around the corner.. I have been baking and eating a lot of late. I wonder if I’ll ever meet my weight losing, goals. Oh my gosh. This looks beautiful. Adding this to my list. My to bake list is growing longer and longer, when ever will I get through them all??? One step at a time gal. Rome was not built in a day. One day you’ll get there! Thinking this would be a great breakfast. The ingredients and appearance remind me of my grandpas coffee cake. Very similar. Thank you, I will let you know how this comes out, I am going with pears! Happy baking and please give me a feedback! This cake is just beautiful and sounds delicious. 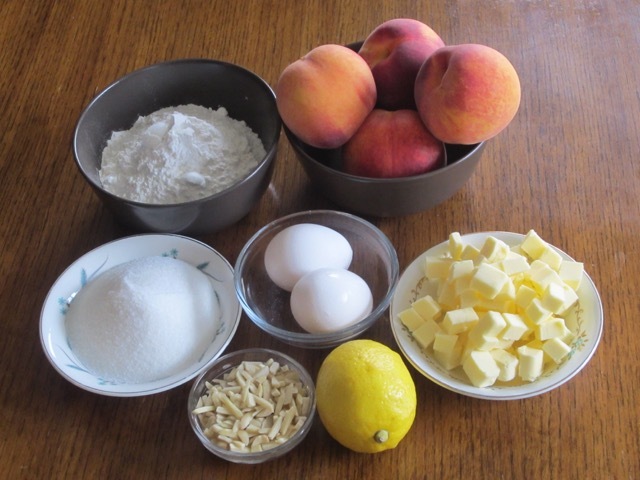 I love peaches and the idea of combining them with almond flavor sounds amazing. Thank you Julie. It was demolished in seconds!